Spotlight is about an artist’s ability to create new meaning using the combination of interactive portraits and diptych or polytych layouts. The mere placement of two or more portraits near each other is a known technique to create new meaning in the viewer’s mind. Spotlight takes this concept into the interactive domain, creating interactive portraits that are aware of each other’s states and gestures. So not only the visual layout, but also the interaction with others creates a new meaning for the viewer. Using a combination of interaction techniques, Spotlight engages the viewer at two levels. At the group level, the viewer influences the por­traits’ “social dynamics.” At the individual level, a portrait’s “temporal gestures” expose a lot about the subject’s personality. Spotlight is a system of 16 portrait agents that operate as a distrib­uted master-slave cluster over TCP/IP. 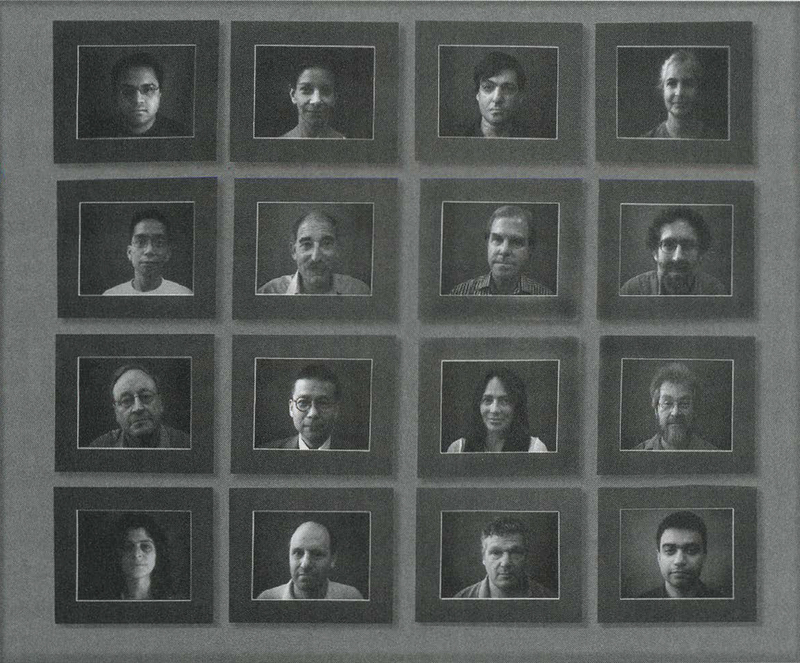 Each portrait agent is a set of nine gestures, each a sequence of 40 photographic-quality black­and-white frames, packaged as a OuickTime movie. There are 16 nodes; each an LCD screen with a built-in computer system. Each node is able to communicate with the others and dis­play a portrait clip. At startup, one node is arbitrarily designated as the master, and all slave nodes are directed to connect to the master node to form the array. Once connected, each node declares its own configuration. The agents exist on the server only but are synchro­nized with their respective portraits over the network. This design simplifies communication between nodes, while retaining synchro­nous, millisecond-scale control over the video playback. In idle mode, each agent may randomly choose a neighbor to “con­verse with.” When viewers initiate an interaction, the agents all “look’ at the agent selected by a viewer. The target agent then plays its gesture action, while the other agents resume their standby pos­ture. The entire array is then reset, and if no further interactions take place, the agents eventually return to idle mode.